Donald Lee Smith was born February 27, 1959 to the late Mills and Margaret Smith in Waycross Georgia. He was affectionally known as “Donail” to everyone. He married Diana Dopson on November 2, 2010 who loved him dearly and remained faithful and loving. Throughout his illness she remained by his side until his passing. Donail moved to Orlando, Florida in 1980. He started work at National Linen Services and worked there for 10 years prior to Lambert Corporation where he worked for 20 years. Donail also worked at Estedes Freight until he became disabled. Due to medical reasons, he had to retire. He was known to be a hard worker and a provider for his family. Donail was preceded in death by his eldest sister Norma Jean and his first wife Renee Smith who had two children Gregory and Jene. 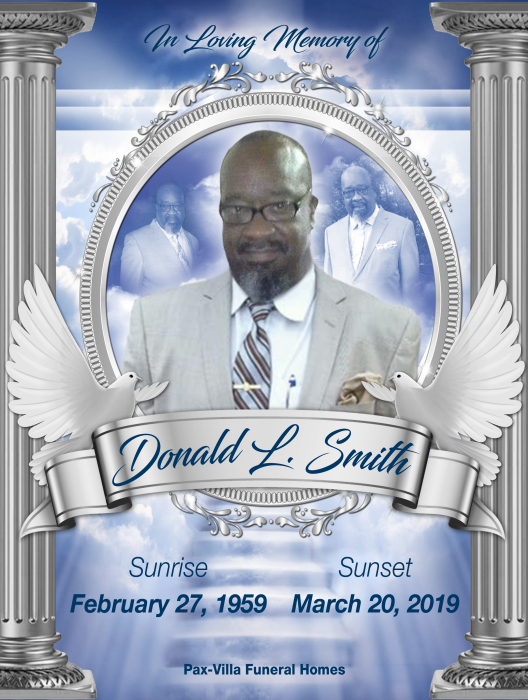 On March 20th, 2019 God called Donald Lee Smith Home. His Siblings: Yoletta Blackshear, Orlando, FL, Mills Smith Jr. (Gwen) Orlando, FL; Jedon Smith (Toni) Orlando, FL; and a host of Grandchildren, Nieces, Nephews, Cousins and Friends.